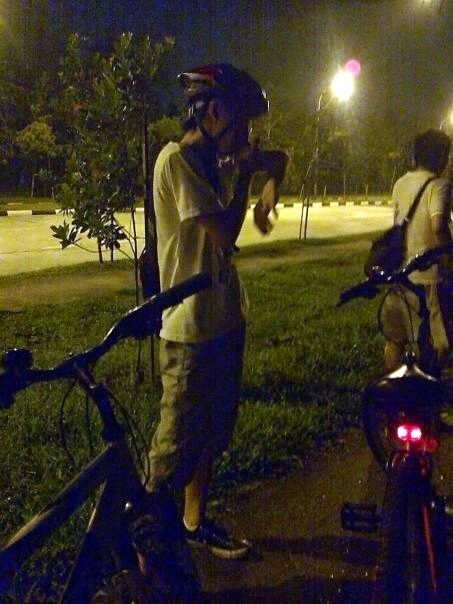 That's the time given for yesterday's night cycling. 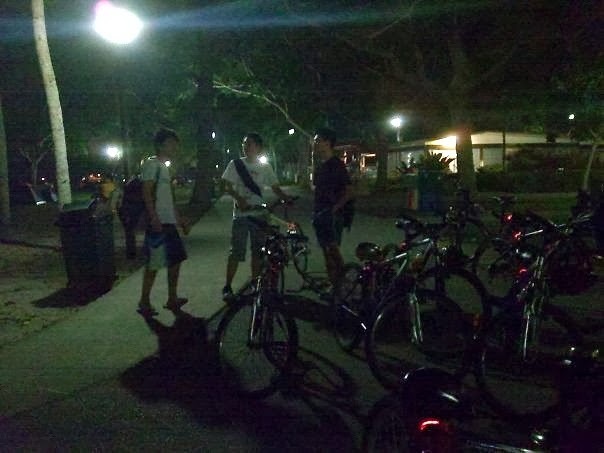 Perhaps this is my first time taking part in night cycling and it's still within the Ghost Festival period, my mom was kinda worried. But in the end she gave in, although full of reluctance. The starting point of this event is at East Coast Park. True enough, it reminded me in the past when I went there for class outing, which was years ago. Even though I've the experience of going there, but I totally forgot the route! I've decided to use a simple and lazy method - Taxi. I set off from Admiralty MRT station, took a train all the way to Bedok. After which I took a taxi to East Coast Park and paid the uncle $5.20. East Coast Park is much wider than I thought, really live up to its name of being the largest park in Singapore. Ships and vessels at the horizon. Anyway, the 9 of us were sorted into the last group or the 3rd group, so-called the "leftovers group". Including me, there's Jun Yan and Zhan Yi! Each and everyone of us were given a bike, cost $14 for the renting fees. It's been ages since I last rode a bike, but I'm glad my basic skills hadn't gone rusty yet. Slacking is over, we continue to cycle towards Pasir Ris. This time round we didn't stay on tracks, but at the side of the roads with the yellow lines. Not many vehicles were acting as our obstacles, so we rode as fast as we could! Reaching Pasir Ris was a terrible experience, the uphill tracks nearly rip my legs muscles apart! By the time I reached the top and going downhill, both my legs were numb. Tampines was next and then Simei, the time reads 5.38am. We rest for an hour, due to everyone being dead tired and exhausted. The Joker Zhan Yi shared his cold jokes, I was laughing my head off! This successfully kept me awake. So it's around 6.30am in the morning, we head back to East Coast Park. Probably the determination to go home and sleep was strong enough to overpower fatigue, everyone seems to cycle faster than before!